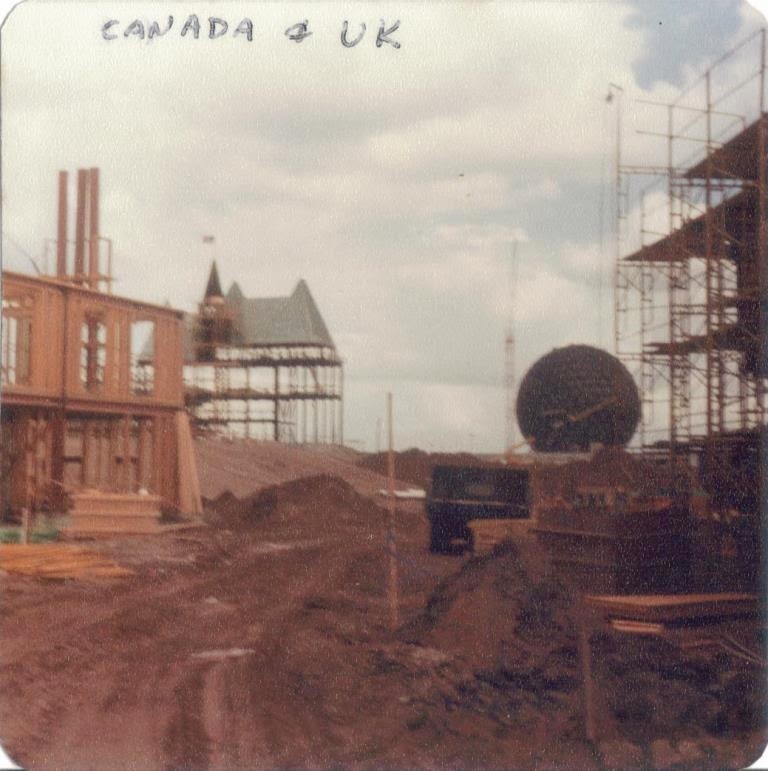 I recently acquired a set of pictures taken during the construction of EPCOT Center. 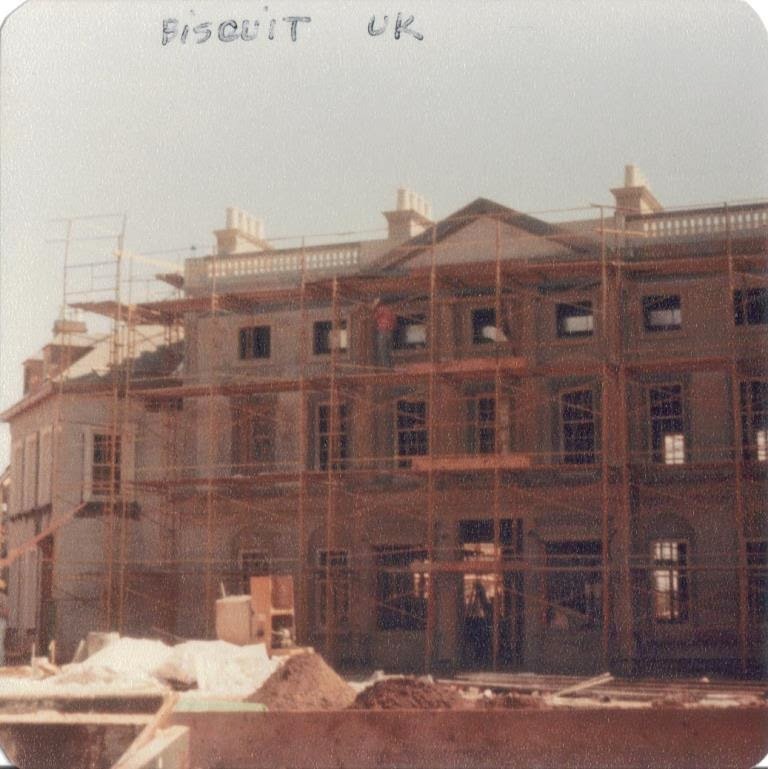 Over 30 pictures labeled by what was being constructed around the photographer. 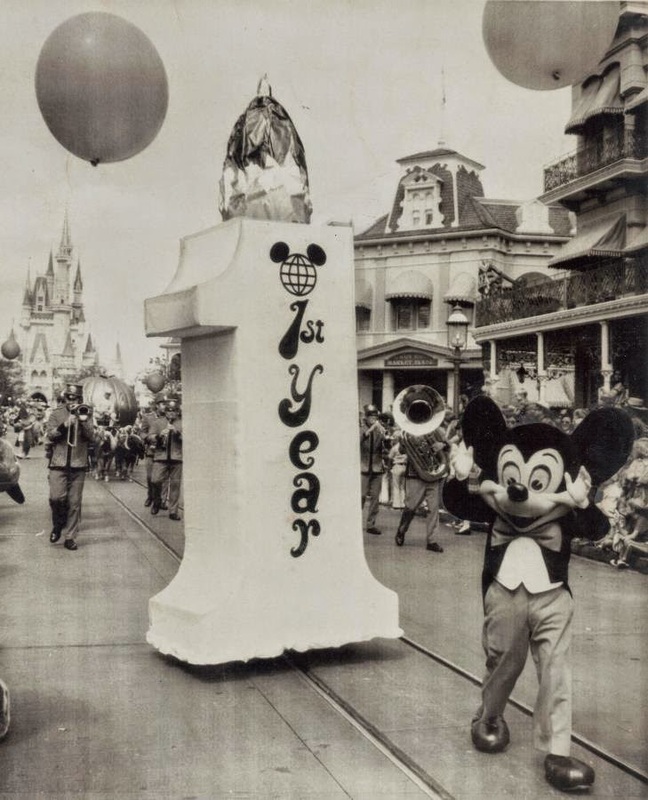 While these types of pictures were strictly prohibited and Disney went through extraordinary measures to try to keep the construction crews, occasionally someone would grab some great photos. While these could have ruined the mystic at the time, they are perfect portals for looking back at the process over thirty years later. We’re going to break up our examination of these photographs into six parts over the next two weeks. It is clear that our photographer was working on a project somewhere around the United Kingdom or Canada, as these were the two spots that had the most pictures. 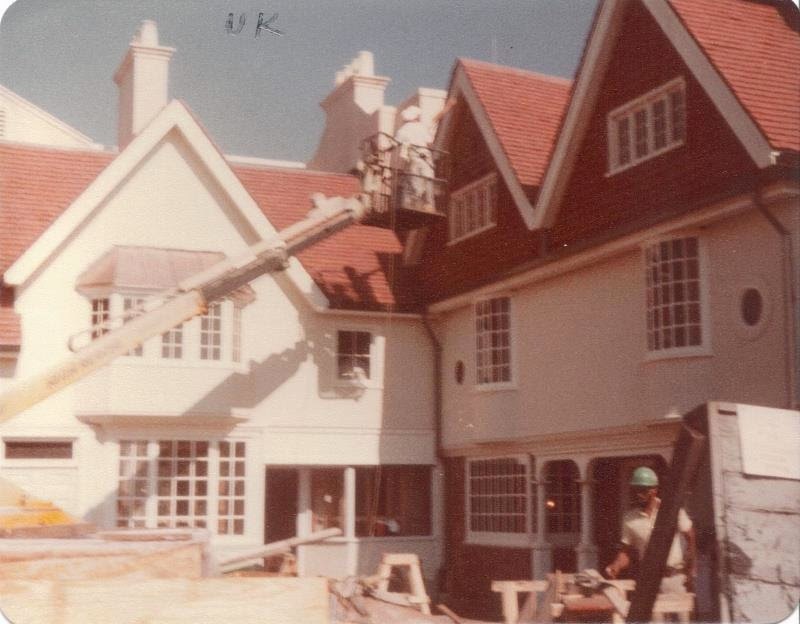 The United Kingdom pavilion was structured between High Street and Tudor Lane, with a design that would allow guests to peruse the various shops while only taking a few steps step outside. Certainly, the interiors had a lot of great things to enjoy, but so too did the exteriors of the Cotswold cottage, the multitude of styles evident in the corner pub, the Georgian row houses, Hampton Court, and other architectural styles. Let’s explore what was being built as it was being built. 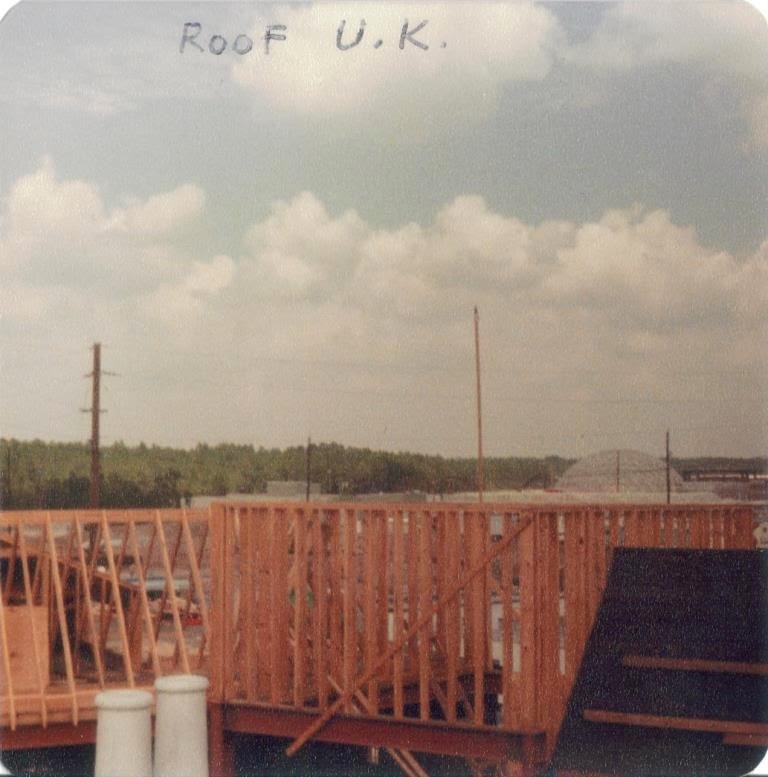 Listed as Roof U.K., you can spot the well-known dome of The Land’s greenhouses in the background behind the temporary power lines and framing of the United Kingdom pavilion. Here we stand at the crossroads of the United Kingdom pavilion. 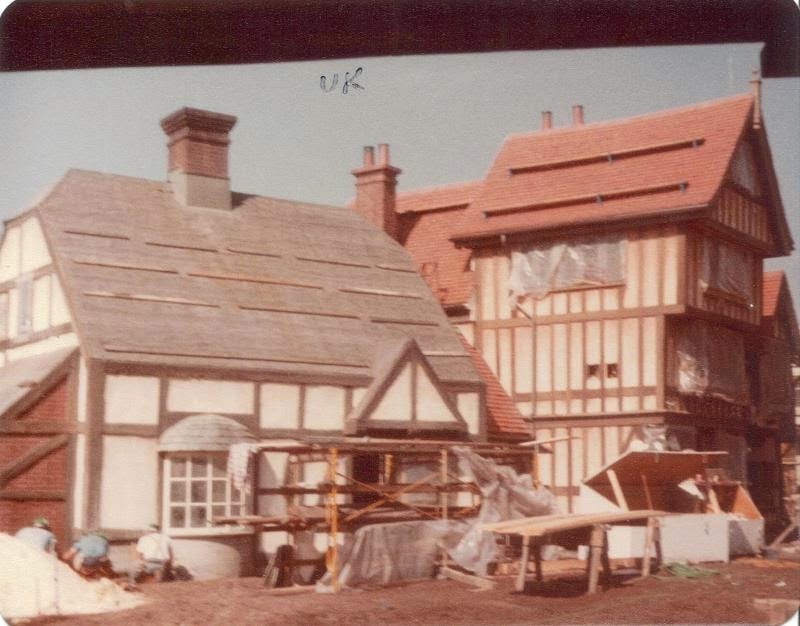 To the right we see the construction of the Rose and Crown, and the shops across the road. Down the lane is the chateau in Canada with Spaceship Earth further off in the distance. 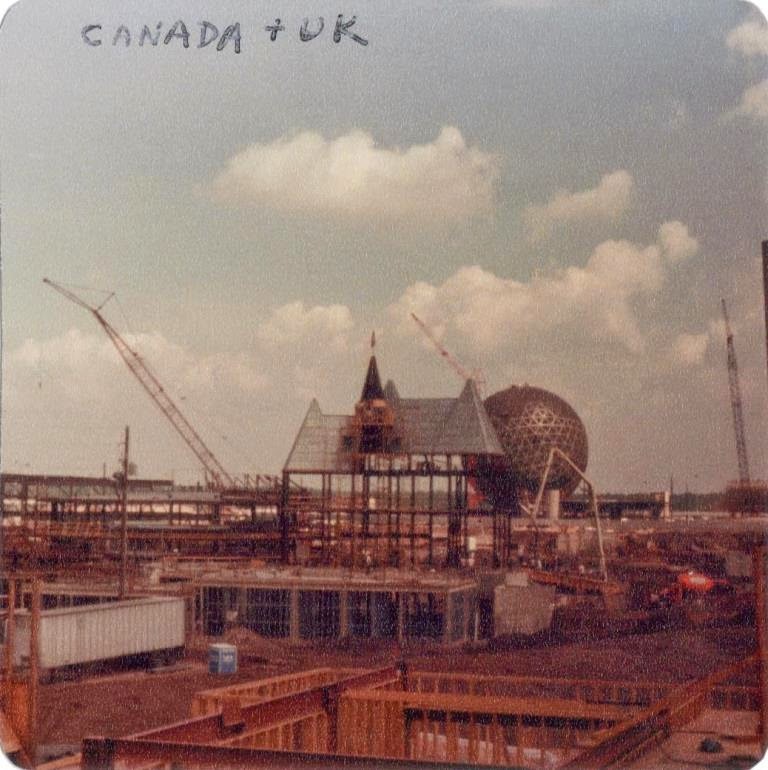 While the framing is taking place for the United Kingdom pavilion here, the real draw is obviously the chateau and Spaceship Earth once again. 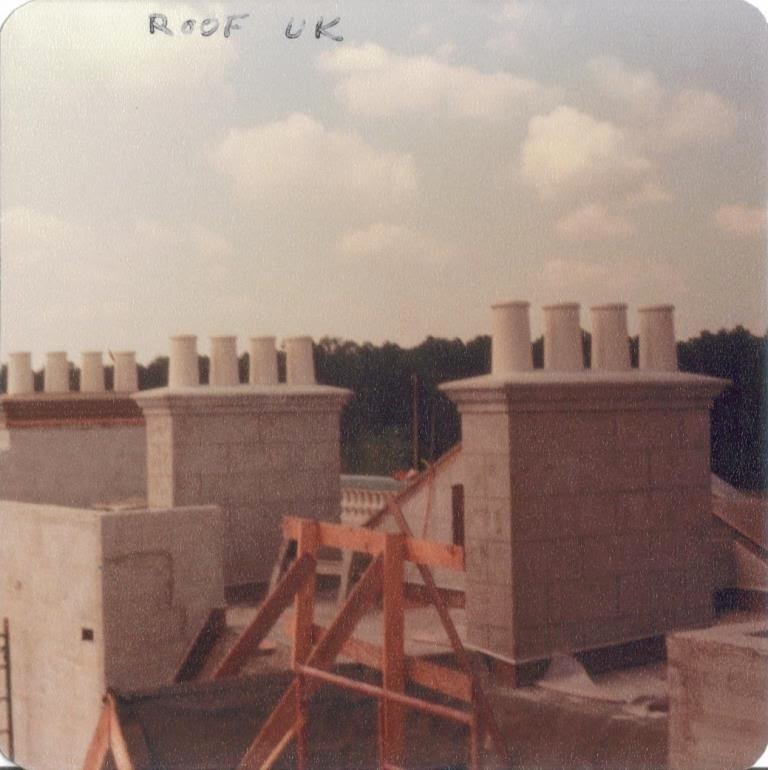 Freshly installed chimneys. These would gain paint and a fresh coat of soot, or textured paint that appears to be soot, to give life to the pavilion. 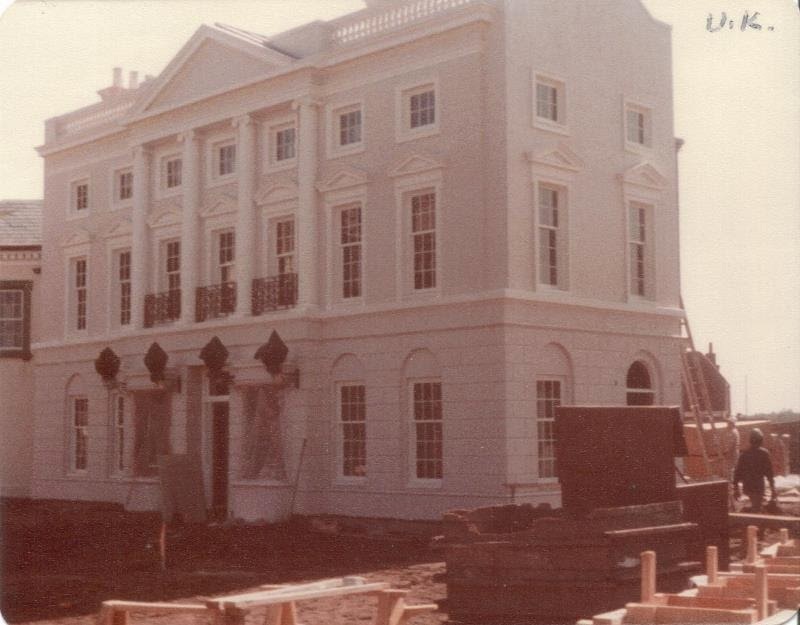 The construction of gabled 1800s structure by the garden square. An almost finished version of the shop exterior seen above. The pedimented gable is much more prevalent here. The small cottage modeled after Anne Hathaway’s cottage in Stratford-upon-Avon. 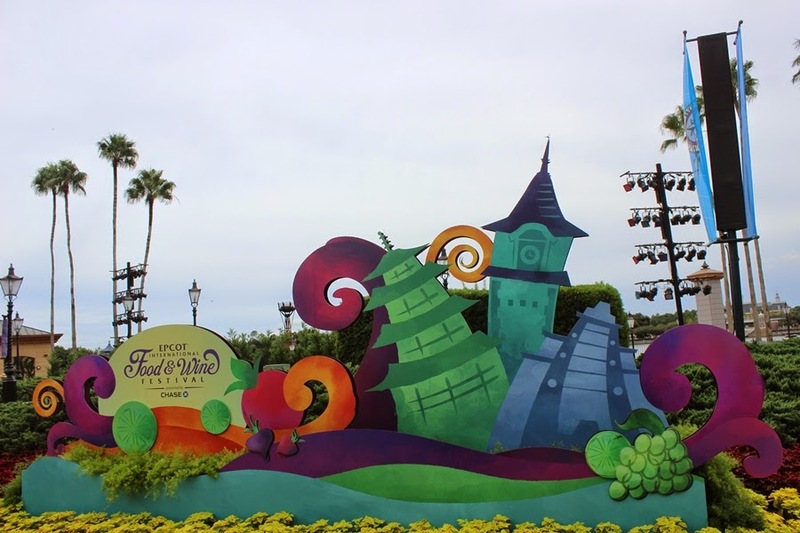 The backside of the cottage area, much of the theme of this corner was inspired by set drawings for Mary Poppins. 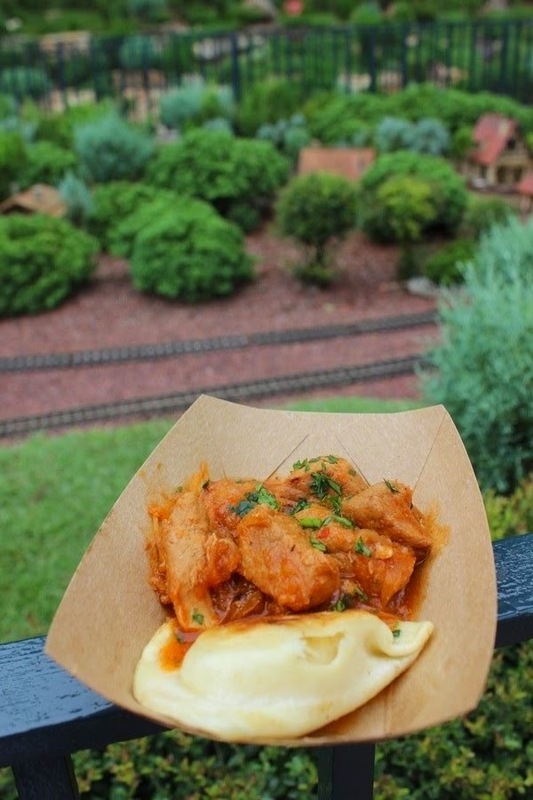 The stage has been set for Epcot’s 2014 International Food & Wine Festival, and the long lines for great food and beverages have been wrapping their way around World Showcase since the end of last week. For those of you planning to attend in the next couple of weeks, I thought we should offer up a top seven list of our favorite bites from our spins around the promenade. Just to be clear, while we sampled something, whether it was food or drink, from all 36 marketplaces, we were just no able to sample everything from every booth. Perhaps, in your taste touring, you’ll find a new favorite that didn’t make it onto our list. If you do, definitely let us know about it in the comments section! 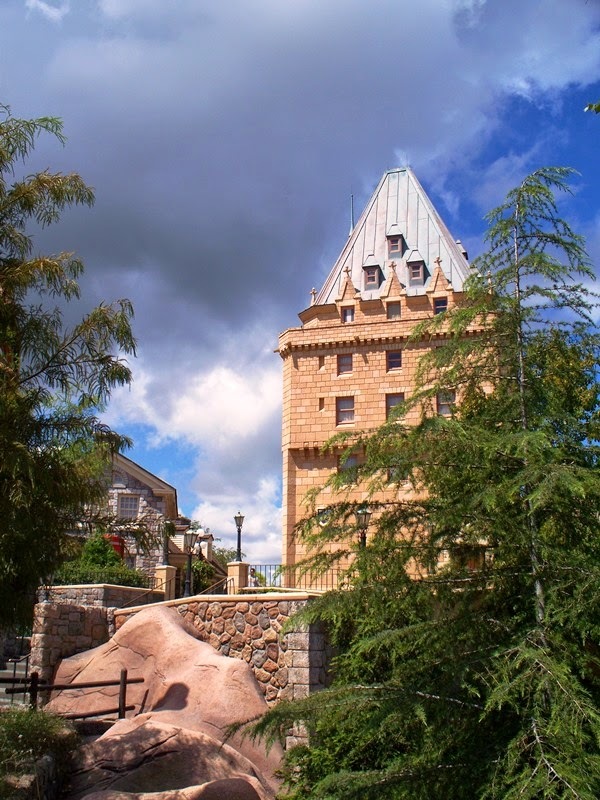 It seems a crime that a bite from Le Cellier, one of the hottest meal tickets in Walt Disney World, barely broke into our top tastes. That only shows you how strong the menus were this year. The accompaniments were great, and added nice flavor to the filet, but what you really come here for is the filet. It was an expertly seasoned cut of beef and left no complaints in terms of flavor. The one drawback to this as a festival offering is that you cannot request your own preparation. While I tend to lean towards medium-well, and this hit that mark perfectly, those looking for something a bit more on the rare side could be disappointed. I did not have high expectations of this dish, and boy was I wrong. The pierogi had a nice crust the contained the sauerkraut and its vinegary bite well. As for the goulash, it was amazing. The pork broke and flaked upon under the weight of the fork, and even though there were hearty chunks of pork, this stew left me wanting more. This cheese trio came with three distinct tastes and trimmings. There is a Purple Haze Chevre Goat Cheese that comes on a toast round, a Cabot Cloth-wrapped Cheddar in honey, and a Cave Man Blue Cheese with cranberries and Marcona almonds. The broad range of flavors here means that there is something for everyone. I love a strong blue cheese, which the Cave Man is, and the honey and cheddar was delicious. However, I’m not a big fan of goat cheese, but the missus loved the soft texture and delicate flavors of the fennel and lavender of the Purple Haze. This quiche-esque dish is a great example of sweet and savory. The ground turkey comes across as almost a spicy beef concoction and plays well with the golden raisins baked beneath the egg mixture. Even in a small portion, the bobotie is more than filling enough to satisfy your appetite. The spices in the turkey and mushroom blend can be a bit strong for those sensitive to heat, so be prepared for a spicy dish. This bite was so appealing that the missus actually dug into it before I could get a picture! The chops are cooked perfectly, no matter what size chop you end up with. The mint chutney is had a great consistency and was not overpowered by the mint. The Potato Crunchies are basically crumbled up potato chips on the chops, but they give the chop another layer of texture and flavor. There is a real danger of getting an overcooked, rubbery scallop when it comes to mass produced sea scallops, but this was perfectly cooked. The spinach gratin and crispy bacon add a complexity to this dish that could otherwise be one-dimensional. I’ll be honest with you, this could have landed in our top spot, but the fact that there is only one sea scallop per order left us wanting a bit more. 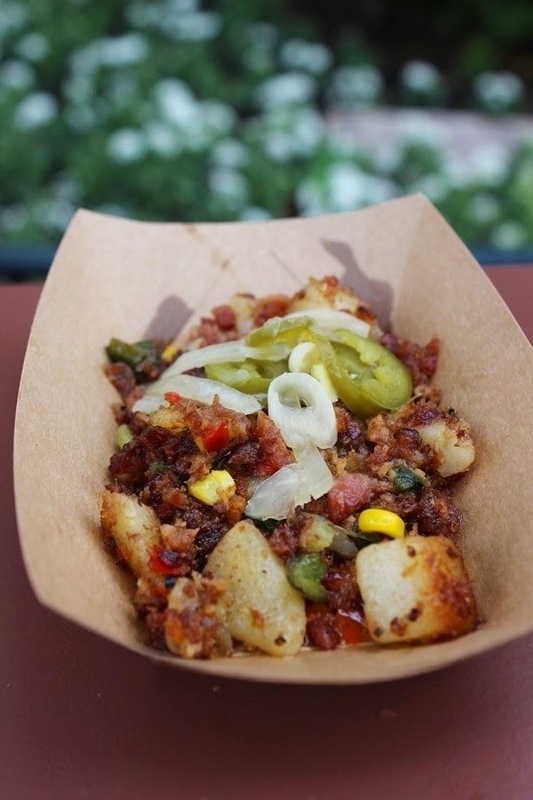 Bacon makes everything better, and when you put them with the heat of the jalapenos, the sweet of the corn, and the earthy flavor of the potatoes you’ve got the best thing we have ever put in our mouths during the Epcot International Food & Wine Festival. I’m not joking when I say that you have to get this as soon as possible! For those of you who are not fans of hollandaise, remember you can get this without the sauce and, honestly, the flavors may be even better without the hollandaise. In case you were keeping score, six of the seven items listed here were either Gluten Free or Vegetarian. Walt Disney World has been doing some amazing work to meet and exceed the needs of the growing number of guests that have dietary restrictions, while still ensuring that meals can be enjoyable to everyone. 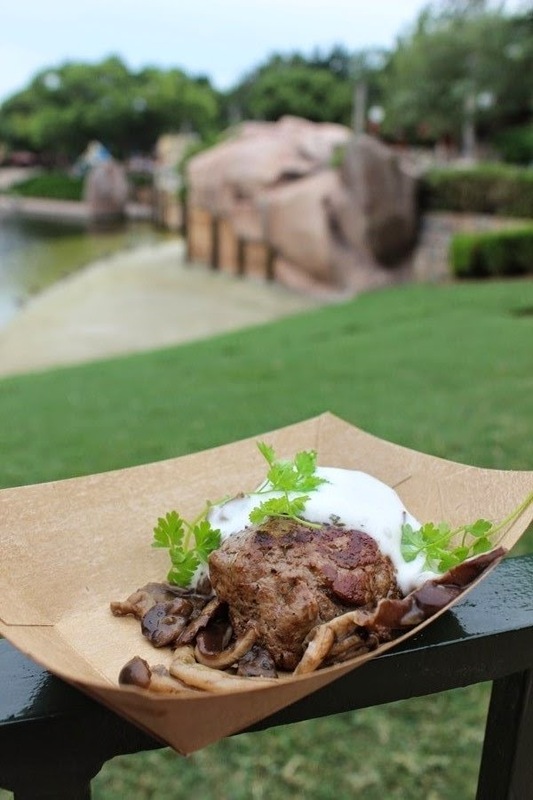 The Epcot International Food & Wine Festival is at the forefront of this movement, and certainly impressed our taste buds! Now get out there and do some taste touring, and be sure to let us know what your favorites were! For so much of Walt Disney World’s history guests were bound by the restriction of 12, 24, or 36 shot film rolls. 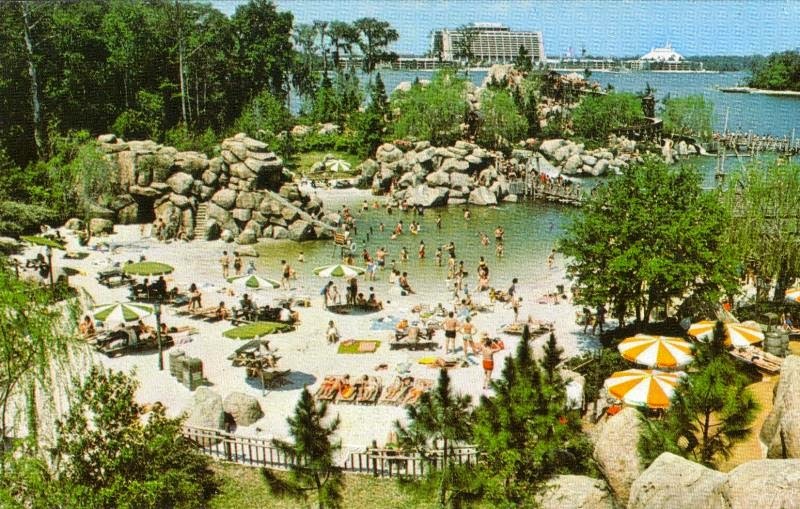 To get some of those perfect shots, the ones you wanted all your friends and family to see, guests were often left to the merciful hands of the postcard photography gods. Walt Disney World never let us down, with postcard after postcard of magnificently timed and/or staged photos that captured the perfect view. Summer may be winding down, but that doesn’t mean that we can’t have one last splash through our favorite water park. Even if it is extinct! 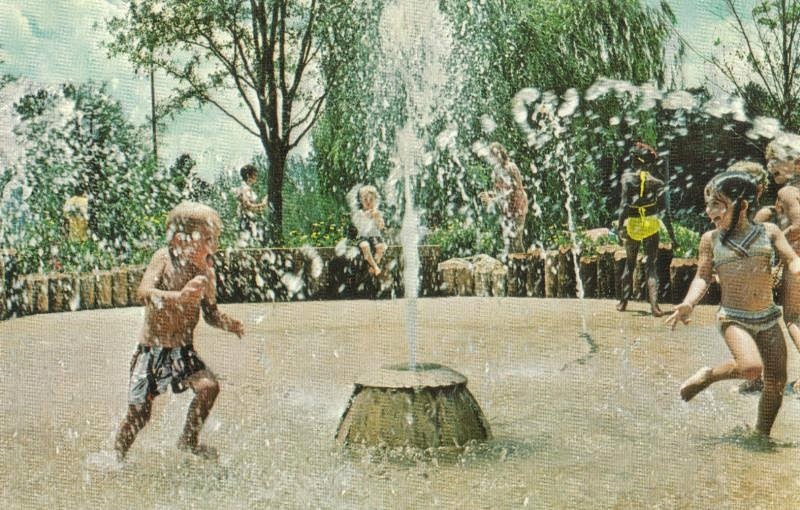 A while back we looked at one of the postcard booklets from Fort Wilderness’ formative years. The booklets that contained mini postcard stubs to take home with you after you had sent the perforated postcard off to a friend or loved-one. This time out, we’re taking a tour through the early years to see just what the swimmin’ hole had to offer! Shooting the White Water Rapids at River Country begins slowly. But soon, guests are caught up in a slippery race with a splashy ending in the Ol’ Swimmin’ Hole. A daring leap into the Ol’ Swimmin’ Hole from a good old-fashioned tire swing. It’s just one of a wealth of childhood dreams that come true in River Country. Whoop-‘N-Holler Hollow in River Country certainly lives up to its name. Packed with slippery twists and turns, it keeps guests whoopin’ and hollerin’ with glee. 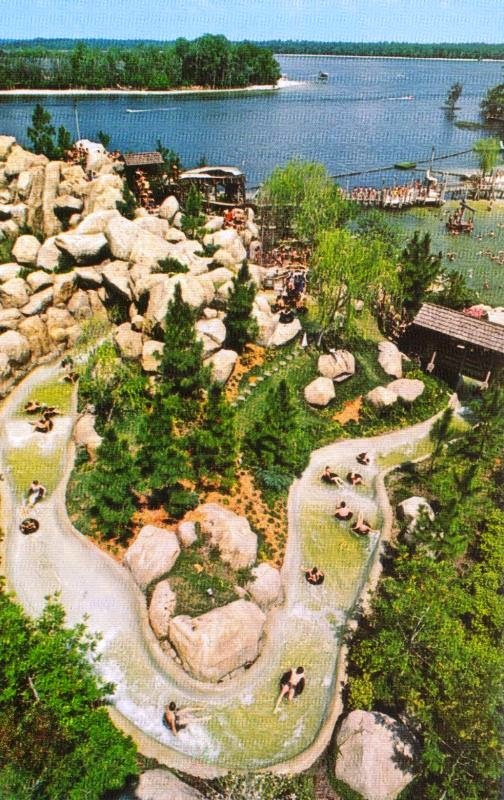 Guests prepare to make a big splash at the climax of their slippery race down the White Water Rapids in River Country… a grand plunge into the Ol’ Swimmin’ Hole. 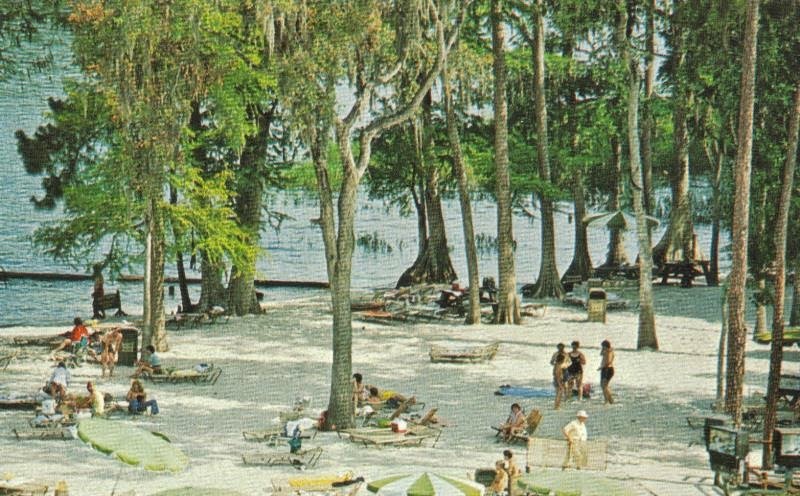 River Country’s quiet beaches are havens for sun worshipping and picnics. Nearby, Cypress Point Trail showcases Florida’s natural splendor. 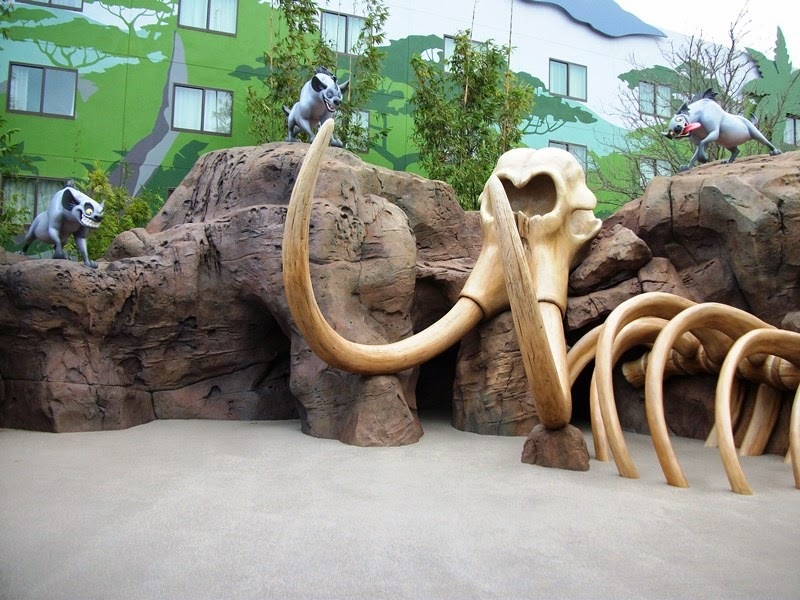 The Play Pond is a favorite aquatic playground for little splashers. 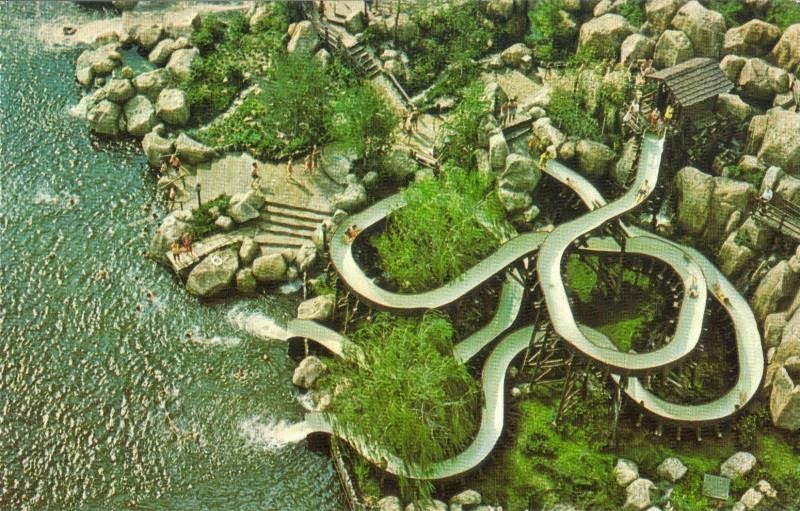 An entire section of River Country overflows with child-size slides and wading pools. 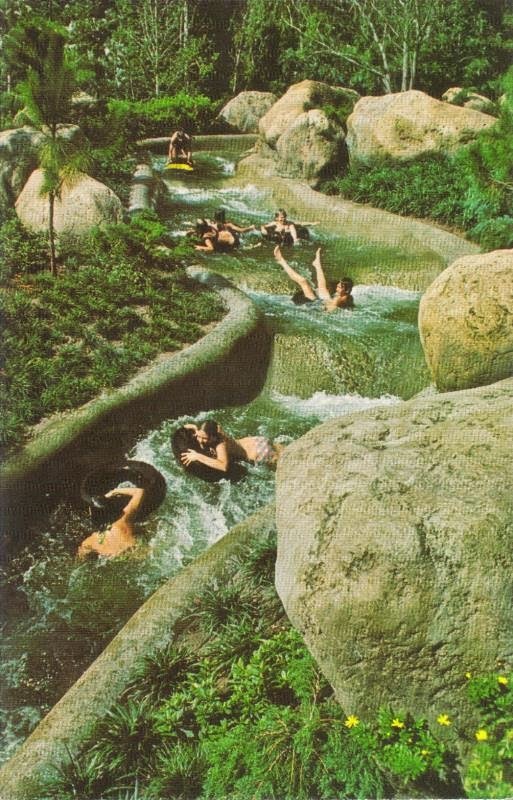 Shooting the White Water Rapids in River Country makes hearts race, as guests whoosh through a waterfall and plunge into the Ol’ Swimmin’ Hole. 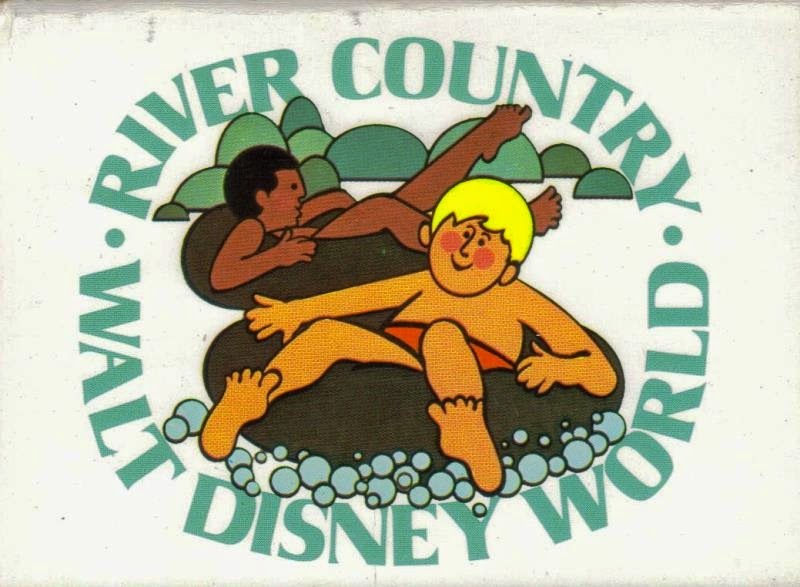 Huck Finn’s spirit lives on at the Ol’ Swimmin’ Hole in River Country. 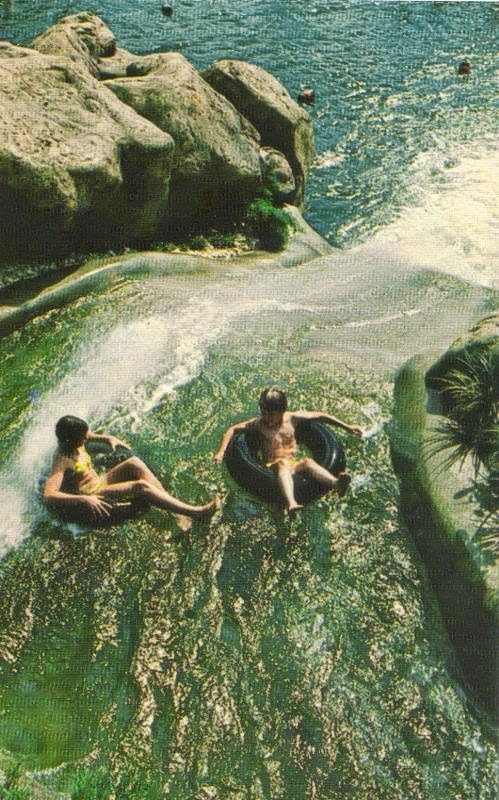 Tire swings, white water rapids, twisting-turning slides, and spacious beaches abound.